A rich and indulgent accompaniment; this traditional French dish includes thinly sliced potatoes in a creamy garlic sauce. 1.Pre-heat the oven to 190°C/327°F/Gas Mark 5 and grease a gratin or a suitable ovenproof dish. 2.Peel the potatoes and place in a pan of cold water, bring to the boil, cook for approx 10 minutes until the slices are tender. Drain using a colander and leave to cool slightly. 3.Layer the potatoes with the onions and garlic into the dish and season with salt and pepper. 4.Mix the yogurt and cream together in a jug, until smooth. Pour the mixture over the potatoes, it should nearly reach the surface of the dish. 5.Sprinkle with nutmeg and parmesan and bake until golden brown and bubbling for approximately 1 hour. 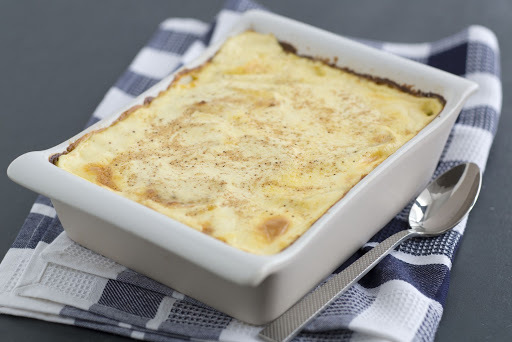 6.Let the gratin rest for 10 minutes before serving and serve whilst still warm. Tip: Try this dish with a traditional Sunday roast.